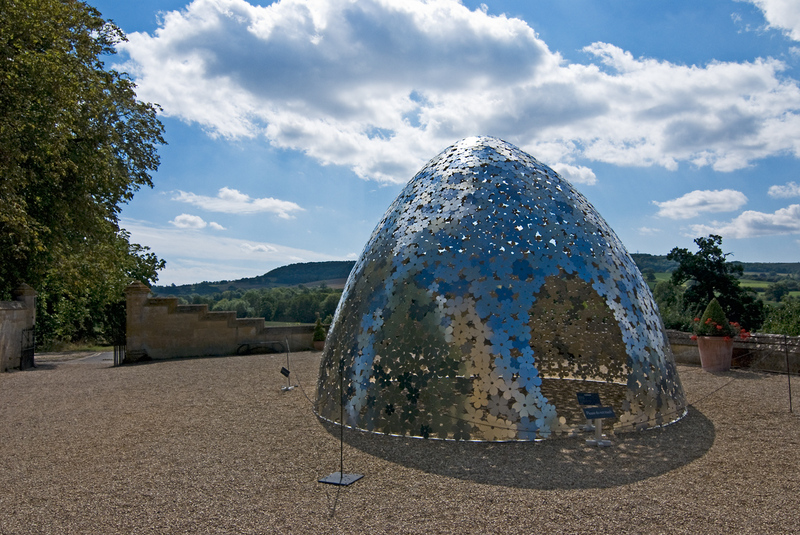 Today’s post celebrates the trend to place modern sculpture, carvings and other art forms – collectively termed ‘Installations’ by some – within the grounds of some of the UK’s vast collection of stately homes and country houses that open their doors to the public. Many of the original gardens and estates were decorated with classic sculptures when they were first laid out centuries ago by well known Landscape Architects such as Capability Brown. It seems appropriate, that centuries later, the tradition of decorative outdoor art is being revived, even if the installations are only temporary and seasonal. All the images are from displays on view in summer 2011. 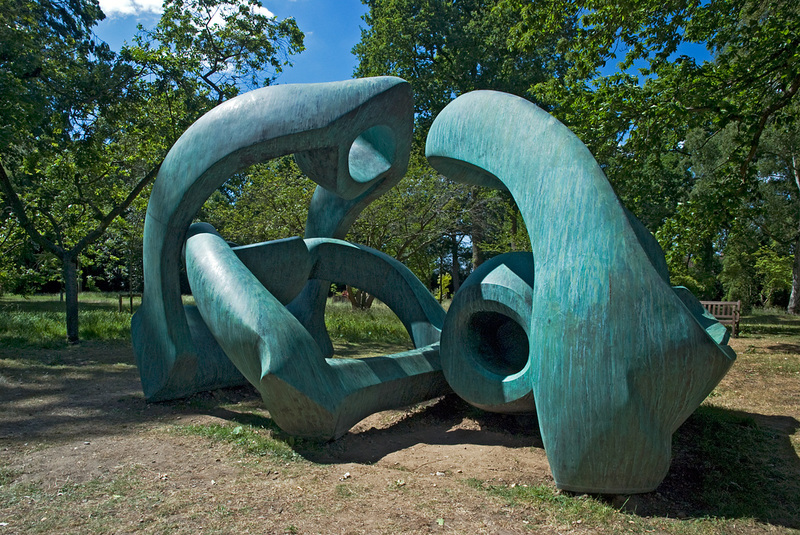 First up is the work of Henry Moore – a world renowned sculptor of semi-abstract monumental bronze figures. 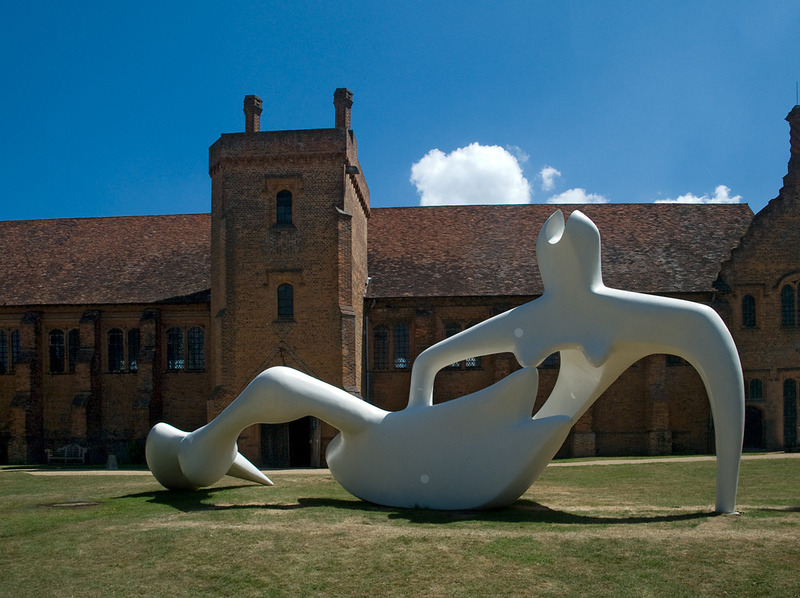 15 of his works were on display in the grounds of Hatfield House. The header image of this Post is of the enormous fibreglass figure that acted as the frontispiece to the exhibition and the only work that was not a bronze. The remainder were scattered discretely, each allotted its individual space, over a wide area of formal gardens and parkland. For a larger set of images of Moore go to Flickr. Here Sotheby’s (the Auctioneers) displayed a selection of works by leading designers around the gardens prior to their sale later this year. These included two crafted out of Aluminium. One that resembled a giant tuning fork and another shaped like an igloo. Blessed with excellent weather (a rarity in the UK this year), they shone magnificently. Most recently we visited Compton Verney. 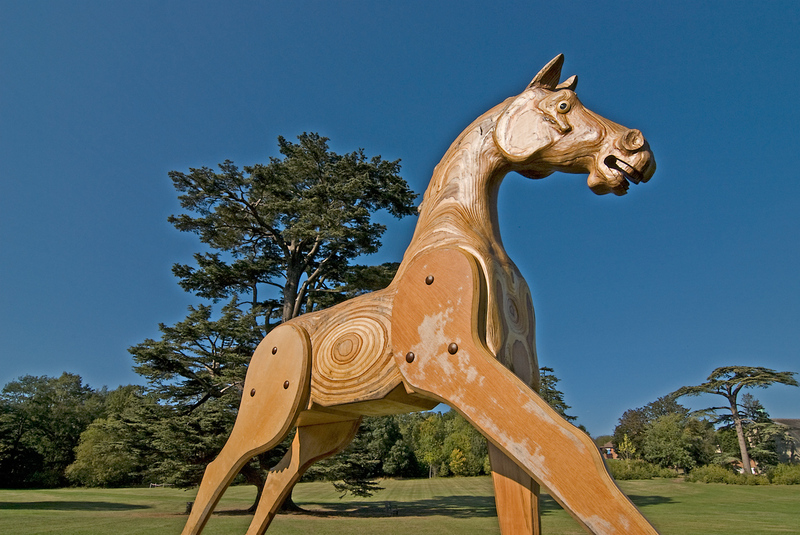 In the grounds, a huge Rocking Horse by Marcia Farquhar made of laminated and varnished marine plywood looked magnificent against a clear blue sky. Hiding in the woods was something altogether more delicate, simple but very effective. 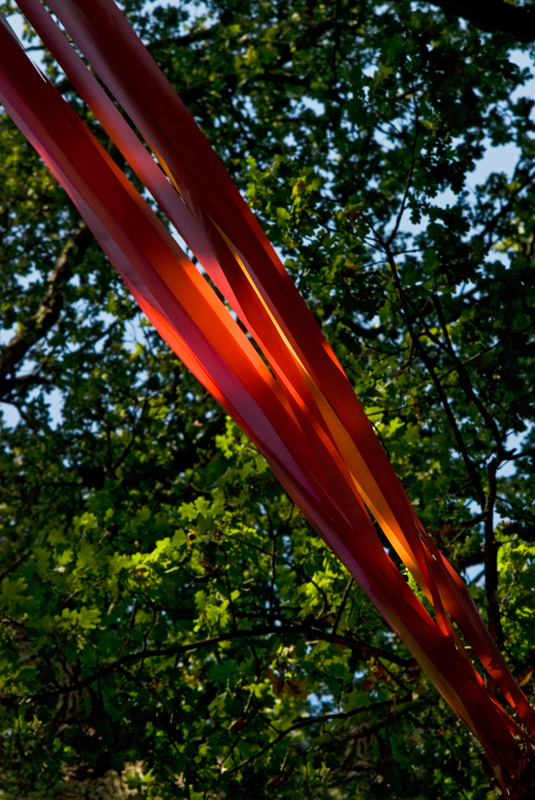 Diagonal tethered strands of polypropylene ribbon by Laura Ellen Bacon. I hope you enjoy these images – the skill lies with the artists, my role has been subsidiary. It’s been a pleasure to be able, occasionally, to work as a documenter and presenter of Art, but it’s not an easy task, waiting for intrusive people to move out of view and working to select the best viewpoint. Street Art will feature in the next post midweek – an art form reviled by some, seldom properly appreciated, but created by some very talented artists. 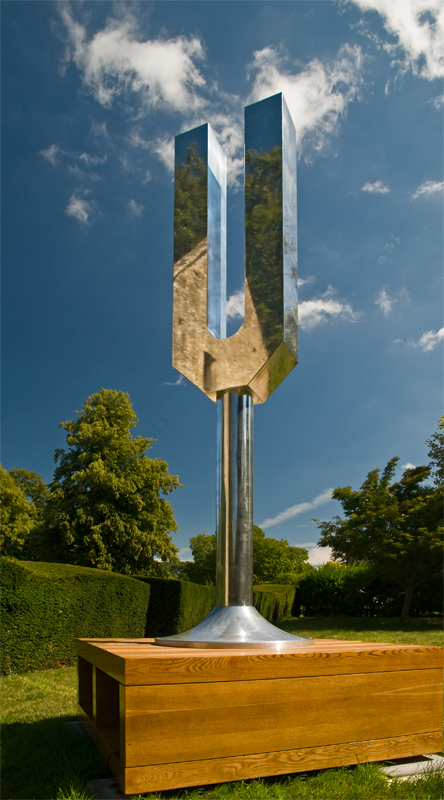 This entry was posted in Art and Scultpure, Country Houses & Gardens and tagged Andrea Salvetti, Bronzes, Compton Verney, Hatfield House, Henry Moore, Installations, Laura Bacon, Marcia Farquhar, Outdoor Art, Paul Fryer, Sculpture, Sudeley Castle, Wood Carving. Bookmark the permalink. Very nice series. These works of art have been captured and presented quite nicely by you. 🙂 That tuning form and the rocking horse are really awesome. Many thanks for the comment and tweet, Jimi. It was good to give myself a challenge. Some interesting art works there. Agree with Jimi, that fork looks cool. You should send the artist the photo. interesting shots. I am not afraid to say that I absolutely hate modern art, but you did a fantastic job capturing them. Well done! I guess I’ve not converted you?! I enjoyed the challenge of this. I only shoot the objects I like. A lot of modern art I just can’t fathom. Dame Vivienne Westwood said recently: “If people learnt to draw properly then we’d get some decent art.” A perceptive remark.